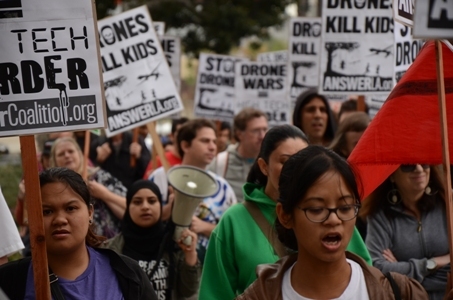 On April 13, hundreds took to the streets nationwide in the largest protests to date opposing the use of drones by the United States government. Buses, vans and car caravans traveled to Washington, D.C., from across the East Coast and New England, while others participated in joint actions in cities and towns as diverse as San Francisco, Sacramento and Los Angeles, California; St. Louis, Missouri; Albuquerque, New Mexico; New Paltz, New York; Boston, Massachusetts; Tallahassee, Florida (on April 11); and Huntsville, Alabama. 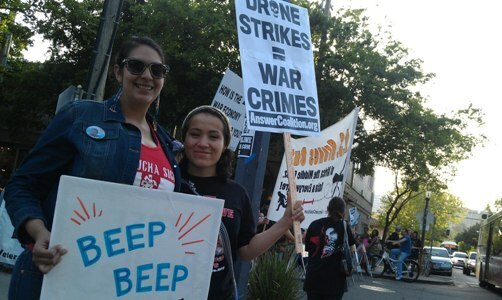 The April 13 protests were part of a month of action opposing drone warfare. Below please find reports and photographs from across the country. The day began with a spirited picket line stretching across the sidewalk in front of the White House. Protestors carried a wide variety of signs with messages including "Drone Strikes = War Crimes" and "Drones Kill Kids." Following the White House picket, demonstrators marched down Pennsylvania Avenue to war-profiteer General Atomics, one of the nation’s largest drone makers. The march carried a number of cardboard coffins, covered in the flags of countries where people have been victimized by drone strikes. Coffins were left at the doors of General Atomics while the names of victims were read out. As each name was read out, volunteers fell to the ground in a “die-in” in remembrance of those killed. Many of the names of those killed and volunteers were children. The stop at General Atomics also featured a spirited hip-hop performance by New York City artist Campesino. Following the march, demonstrators assembled for an indoor program at George Washington University, where speakers further explained both their motivations for attending and various aspects of the brutal drone warfare program. The rallies at the White House and GWU were MC’d by Eugene Puryear of the ANSWER Coalition. Some of the speakers throughout the day included: Zaki Baruti, President/General, Universal African Peoples Organization; Akbar Muhammad, International Representative of the Nation of Islam; Rev. Graylan Hagler, Senior Minister, Plymouth Congregational United Church of Christ; Eric Edi, Committee of Actions for Cote D’Ivoire (CACI); Col. Ann Wright; Mara Verheyden-Hilliard, Executive Director, Partnership for Civil Justice Fund; Gnaka Lagoke, Reviving Pan-Africanism Forum; Leo Gnawa, CRI-Pan-Africain USA; Brian Becker, National Coordinador, ANSWER Coalition; Representatives of Political Education and Action Committee, Howard University (PEAC); Noor Mir, Code Pink Drone Campaign Coordinator; Damián Fontanez and Valerie Kiebala, American University Students for Justice in Palestine; Bushra Maktari, Progressive Youth Organization on Yemen; Paul Seltzer, Progressive Student Union, George Washington University; Pasamba Jow, Democratic Union of Gambian Activists; Diop Ologubala, Black is Back Coalition; and others. Click here to see more photos from Washington, D.C. In San Francisco, more than 200 people gathered at the central intersection of Powell and Market Streets to demand an end to drone attacks abroad and drone surveillance at home. The action was called by the ANSWER Coalition and joined by activists from World Can't Wait, Code Pink, Bay Area Latin American Solidarity Coalition, West County Toxics Coalition, Single Payer Now!, Unitarian Universalists for Peace-SF, United National Anti-War Coalition, Oscar Grant Committee, WORD–Women Organized to Resist and Defend, Party for Socialism and Liberation, and others. A number of local TV stations, including Channels 2 and 5, covered the protest. A dramatic symbol that drew much attention by passers-by and the media was the World Can’t Wait’s one-fifth-size replica of a Predator drone. After the speak-out, there was spirited march to UN Plaza. The event was MC'd by Salma Elshakre and Frank Lara of the ANSWER Coalition. Speakers included: Dr. Henry Clark, West County Toxics Coalition; Toby Blomé, Code Pink; Stephanie Tang, World Can’t Wait; Jeff Mackler, United National Anti-war Coalition; Sarah Carlson, Women Organized to Resist and Defend; Les Friedman, Oscar Grant Committee; Omar Ali, Party for Socialism and Liberation; Mazda Majidi, ANSWER Coalition; Toya Mileno, National Committee to Free the Cuban Five; and Kathleen Densmore, Bay Area Latin America Solidarity Coalition. The picket line was followed by a short speak out, during which participants in the demonstration talked out their opposition to drone war. Speakers included representatives of ANSWER LA, Veterans for Peace, Kabataang maka-Bayan Pro-people Youth, the Party for Socialism and Liberation and WORD (Women Organized to Resist and Defend). After the speak-out, protestors marched through several blocks of downtown Los Angeles before finishing the rally on the west steps of City Hall. 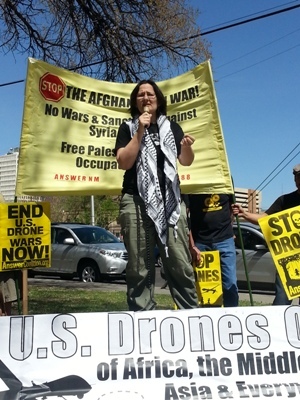 Protesters in Albuquerque, N.M., gathered to speak out against the escalation of drone warfare and surveillance both overseas and at home. The ANSWER Coalition of New Mexico held a rally at a downtown park. Activists from ANSWER and other organizations, as well as members of the immigrant and religious community, spoke out against the militarization of the U.S. border and the deadly use of drones in overseas wars. One speaker drew attention to the case of Abdulrahman Al-Awlaki, a U.S. citizen and member of the Albuquerque community who was assassinated by a drone. From there, people marched to the downtown office of Lockheed Martin, a major drone aircraft manufacturer. Lockheed Martin is one of several major war profiteers in New Mexico, along with Sandia National Laboratories and Los Alamos National Laboratory (the lab where the atom bombs dropped on Japan were designed and tested). Two dozen activists took part in a demonstration April 13 in New Paltz, N.Y., demanding, “End drone attacks abroad/End drone spying at home!” The event was organized by the Hudson Valley Activist Newsletter and co-sponsored by New Paltz Women in Black, Occupy Southern Ulster, Middle East Crisis Response, Real Majority Project, Dutchess Greens, and Dutchess Peace. People from diverse Sacramento communities came together to protest drones in conjunction with the National Day of Action. People gathered in midtown Sacramento at the city’s Second Saturday Art Walk. Protesters held signs and banners, and chanted anti-war and anti-drone slogans. They outreached to the public and informed them about the issue of U.S. drone surveillance and violence. The protesters received support from the people on the streets and the honking passing cars. Some passers-by joined the protest to chant or get more information. The protesters included members of the ANSWER Coalition, Sac Peace Action, M.E.Ch.A, Party for Socialism and Liberation, the Peace and Freedom Party, Veterans for Peace, Women Organized to Resist and Defend (WORD), and students and from local colleges and universities. On April 11, students at Florida State University in Tallahassee held a “U.S. 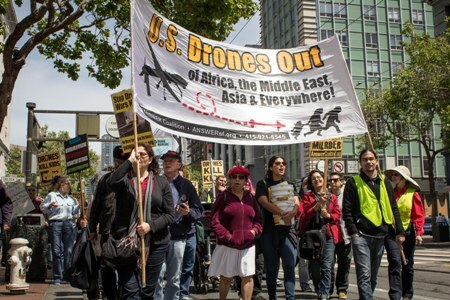 Drones Out of Africa, the Middle East, Asia and Everywhere!” action in solidarity with the April 13 White House Rally and March in Washington, D.C. The action took place on Landis Green, the university’s “free speech zone,” in the busy center of campus. From 11:00 a.m. until 4:00 p.m., students handed out info sheets about the expanding U.S. drone program overseas and at home. Signs such as “Drones Kill Kids,” “Drone Strikes = War Crimes,” and “5,000 killed in Pakistan, Yemen and Somalia (Most Civilians)” reached hundreds of students. Many students learned about drones for the first time, while others expressed their support for the protest and joined in. At 4:00 p.m., representatives of ANSWER Coalition, Students United for Justice in Palestine, the Center for Participant Education, Veterans for Peace and Progress Coalition, the event’s sponsors, gave speeches that rang throughout the campus. They spoke about the illegal nature of U.S. drone strikes, the shocking civilian and child death tolls, and resistance to drone warfare as part of a larger struggle against the military-industrial complex and imperialism.